The mainstream media usually report UK House Prices at a national level. Recently we went one level deeper by examining English and Welsh property at County Level however this data left an elephant in the room. That elephant was London, a small village located in the South East of England with a population of 8.2 million, and one which was included as a single data point. Today let’s go deeper into London and look at the Salaries, House Prices and Value of each London Borough. To Value the London market by borough we will maintain consistency with our previous definition which is a simple Price to Earnings Ratio (P/E). As with the County level analysis we will use the Land Registry House Price Index for prices. We’ll stay with calling high house prices bad (the Borough with the highest average house price, unsurprisingly, is Kensington & Chelsea at £1,104,770 and is shown in dark red) and low house prices good (the Borough with the lowest house price is Barking & Dagenham at £213,581 and is dark green) with all other prices shaded between red and green depending on house price. What I find amazing is that Barking & Dagenham, the cheapest Borough, is still 32% more expensive than the England and Wales average. For Earnings we’ll also stay with the 2012 Annual Survey of Hours and Earnings (ASHE) which provides information about the levels, distribution and make-up of earnings and hours paid for employees within industries, occupations and regions in the UK. To ensure that our Earners and Houses are located within the same Borough we’ll use the Earnings by Place of Residence by Local Authority. We again multiply the data by 52 weeks to convert it to an annual salary. We stay with calling low earnings bad (the lowest average earnings are £19,183 in Newham which surprisingly is only 8% higher than the lowest County which was Blackpool and is shown in dark red) and high earnings good (the highest average earnings are £59,441 in Kensington and Chelsea and is dark green) with all other earnings shaded between red and green depending on earnings. 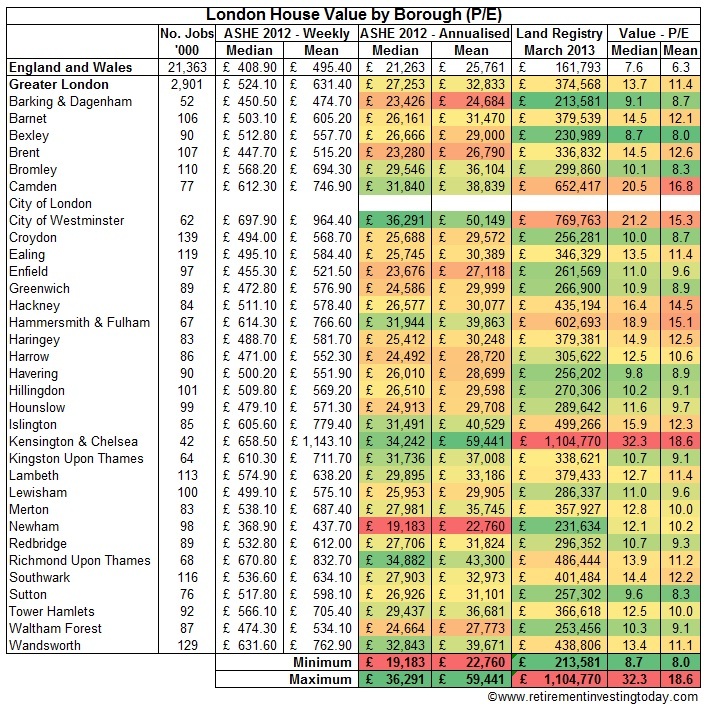 By combining the two datasets we can see the valuation of houses across the Borough’s of London. The formula is Value equals Price divided by Earnings (P/E) with the result also shown in the table below. Kensington and Chelsea is sitting on a massive valuation of 32.3, more than 4 times that of the national average. I think this is spurious data though and should be ignored. After all a Russian Oligarch or Saudi Prince is hardly going to be earning a salary plus as non-Domiciles they won’t be reporting what they’re earning off shore. The next borough down is Westminster on a still crazy 21.2 however I’m guessing even here there’s plenty of wealthy foreign non Domiciles and those taking part in the rentier society of Great Britain who also don’t have to work. The “best value” borough looks to be Bexley however I’d hardly call it good value at 8.7 times average earnings. An interesting thought anonymous. The question for me becomes if housing wasn't so expensive (say if planning had have allowed more housing to be built) would those people on lower wages need government assisted housing or would they now be able to afford their own?
" I think this is spurious data"
As is any data other than the multiple of actual housebuyers against actual house prices paid. Which according to the CML never crossed 3.5 times income for FTB-s even at peak, and for 2TB-s never crossed 3.0. I don't know anybody that has paid 8-10-12 times income for their house. The banks wouldn't lend that, even in 2007. When we have a massive shortage of housing, which we do, then the only incomes that matter are those of the people that can afford to buy. As the market will always ration goods in limited supply through price. This is why analysis based on assuming prices will return to historical averages of income multiples is flawed. Historically, we've never had this kind of shortage before. Nor indeed, the lower rates and dual income households to be able to afford it. As someone once said, when you only build enough houses for a third of the people that want one, the only the top earning third need to be able to afford them.... And a rising tide lifts all boats. Welcome back A1. It's been a while. You're putting the supply and demand argument on the table. This is something that is fixable and only takes willingness from a few to get the ball rolling. My worst fear however is that you are right and we continue heading more and more into a rentier society which suits those who already own the housing. I actually find it quite distasteful that one of the Safety elements of Maslow's hierachy of needs, property, is restricted like this in a supposed civilised society. Interesting analysis and I'd echo the comments suggesting that property valuations won't necessarily revert to a reliable multiple of earnings anywhere. 1. Non-linear sources of income and wealth pushing up prices beyond what can be afforded over a lifetime on an average or even above average salary. Not just in Chelsea - even where I live I'm hearing ad nauseum that "the Chinese are buying Cambridge" or similar. 2. The power of (regional) supply/demand. Green belts, height restrictions, nimbyism, being a small island, transport, immigration, longer lifespans, baby boom, etc. This is why people are living in 'sheds with beds' in parts of London. What we might be seeing now in the UK is what I'll call "Peak Housing". As with the (disputed) concept of peak oil, perhaps we've already seen the maximum house/people ratio we'll ever see and availability is now declining. If that's true then I predict few people will be able to afford to buy a house in their lifetime, and we'll go back to the pre-war situation of a small number of super-landlords owning most of the country's property. With the inheritance tax threshold now frozen at £325,000 until at least April 2015 it's not as if you can even pass your home onto your children so they don't face the same fate. "As with the (disputed) concept of peak oil, perhaps we've already seen the maximum house/people ratio we'll ever see and availability is now declining. If that's true then I predict few people will be able to afford to buy a house in their lifetime, and we'll go back to the pre-war situation of a small number of super-landlords owning most of the country's property." Number 1 could be stopped or slowed if our leaders wanted it thus. It might even be appropriate given the current shortage of housing. Number 2 could also be solved with willingness. Building on what I said above in reply to A1. I love this country but when society is being permanently damaged by a few, to benefit themselves, it does leave a bit of a nasty taste in the mouth. The problem is that most people just don't see it. I find it bizarre that people say high house prices good, high bread prices bad. It's just bizarre. "If something can't continue, it will stop"